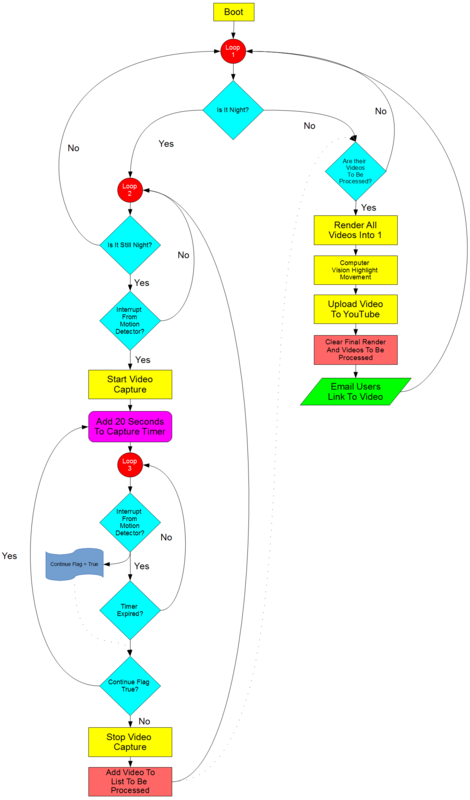 So I’ve been working a lot in the past day in ironing out part of the night side loop (loop 3 in this diagram). Basically, it starts recording based on an input from a sensor and continues to record until these inputs stop occurring. print "Filming For " + str(time) + " Seconds"
FilmDurationTrigger() Takes the period of time that will be filmed, in this example, it’s 5 seconds just to conserve time, but in application it will be 20 seconds. This code will pause for the input time, and continue to be paused upon inputs from GetContinueTrigger(). This delay allows the code to continue filming until there are no inputs. In this example, GetContinueTrigger() returns a Boolean if a random event occurs, but in application it will return a Boolean based on the status of a motion detector. These two test shows that variable capture length functionality works! As a note, the actual times on the output video varies from the amount of time that it’s designed to record for. This is because the variable frame rate nature of the video coming out of the camera module, it causes the videos to come out a little short, but they still contain all the frames of the amount of time desired to record, just scaled slightly by frame rate error. One of the biggest problems with the built in commands for using the Raspberry Pi Camera module is that you can’t stop a recording after an unknown time. You can record for a given number of seconds and that’s it. I have attempted to solve this problem by backgrounding the initial record process with a time of 27777.8 hours (99999999 seconds) when it’s time to stop recording, the process is manually killed using pkill. Here is a test of my code, which I’ve called CameraModulePlus (written in python) which takes two videos, one for five seconds, and one for ten seconds, with a 10 second delay in between. As you can see, it works pretty good for how barbaric it is. The full class for CameraModuleVideo can be found here. In the future, I’d like to encode a lot more data into the CameraModuleVideo class, things about time etc. Also I would like to monitor available space on the device to make sure there is enough space to record.